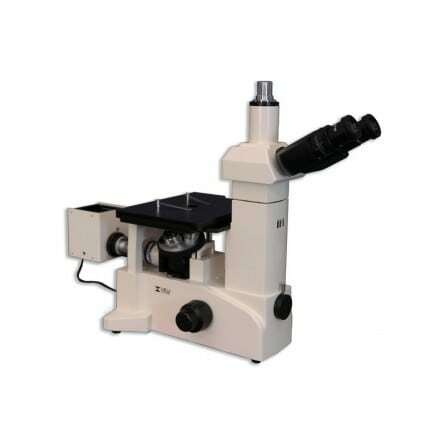 The Meiji Techno IM7000 Series Inverted Brightfield Metallurgical Microscope have an ergonomic slim triangular shaped design that saves bench space to maximize efficiency and offers ultimate stability with its cast aluminum alloy frame. 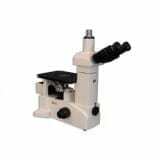 This is the most rugged Inverted Microscope from Japan. Infinity Corrected Planachromat 5X, 10X, 20X and 50X objectives are standard in all units. All of our IM7000 Series controls are ergonomically positioned to provide comfort and extended ease of use for the operator. An integrated 6V/30W vertical Koehler halogen illuminator with variable intensity control and automatic voltage sensing power supply provides excellent specimen illumination and contrast. The IM7000 Series is designed to meet your most diverse needs for materials research. 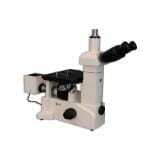 Meiji’s IM Series is well suited for examination of mounted metallurgical specimens or for routine quality inspections such as, microstructure analysis, various materials testing, QA and QC examination and photomicrography. 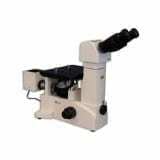 The IM7000 Series offers crisp, distortion-free, high resolultion images in multiple modes of operation the built in photo port on the front of the body makes image documentation quick and easy. 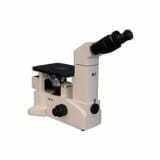 Contrast methods available include: Brightfield and Polarized Light observation modes. The Meiji Techno IM7500 Series Inverted Brightfield/Darkfield and simple Polarizing 12V/ 50W Metallurgical Microscope have an ergonomic slim triangular shaped design that saves bench space to maximize efficiency and offers ultimate stability with its cast aluminum alloy frame. This is the most rugged Inverted Microscope from Japan. Infinity Corrected Plan Semi Apo BD 5X, 10X, 20X and LWD 50X objectives are standard in all units. All of our IM7500 Series controls are ergonomically positioned to provide comfort and extended ease of use for the operator. An integrated Incident High power 12V/50W vertical Koehler Halogen illuminator with variable intensity control and automatic voltage sensing power supply provides excellent specimen illumination and contrast. The 50W illuminator affords a brighter image as of a competitive 12V 100W system, reducing power consumption by almost 50 percent. The IM7500 Series is designed to meet your most diverse needs for materials research. Meiji’s IM Series is well suited for examination of mounted metallurgical specimens or for routine quality inspections such as, microstructural observation, and analysis and evaluation of a variety of metallurgical metals ceramics, polymers and various materials testing, QA and QC examination and photomicrography. The IM7500 Series offers crisp, distortion-free, high resolution images in multiple modes of operation the built in photo port on the front of the body makes image documentation quick and easy.